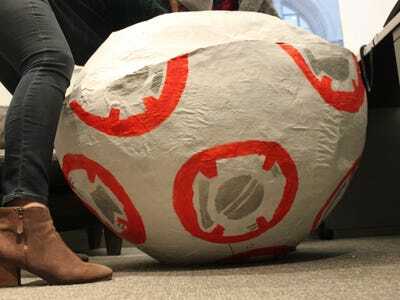 Disney/LucasFilm via YouTubeBB-8 on the move. 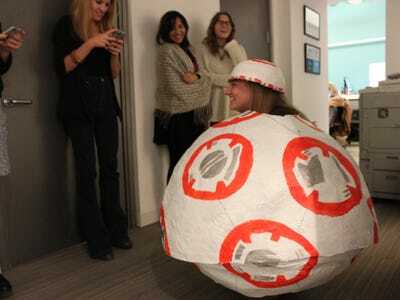 One of the few things we know about “Star Wars: The Force Awakens” movie is BB-8 — so I turned myself into one for Halloween. The droid, which director J.J. Abrams named for its figure-eight shape, can be seen rolling around in the film’s trailer. It’s also been turned into a massively popular toy. 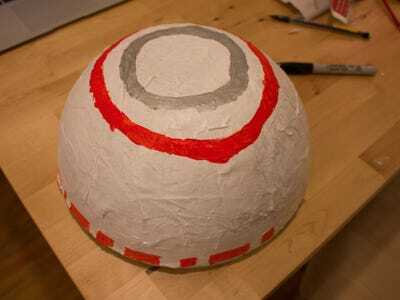 Using a giant balloon, papier maché, paint, duct tape, and a lot of patience, I set out to create my own version of the adorable little droid. Only my version isn’t little. It’s giant. 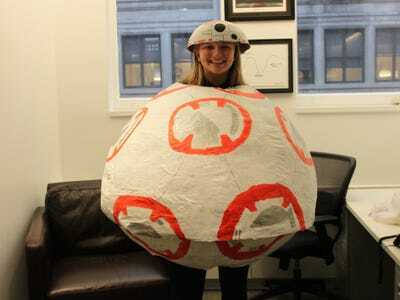 Keep reading to find out how to build your own BB-8 costume. 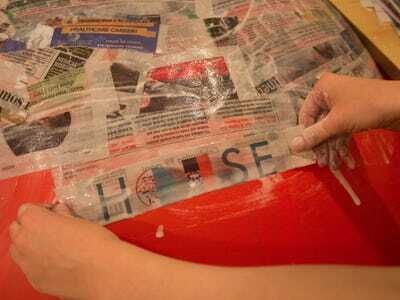 Step one, inflate the largest balloon you can find. 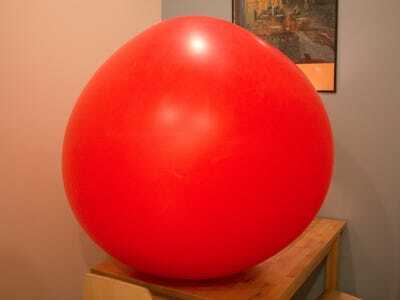 It needs to be big enough to fit a person inside, so we're talking really big. Draw circles on both the top and bottom. These will be holes for your head and feet, so you won't cover these sections in papier maché. 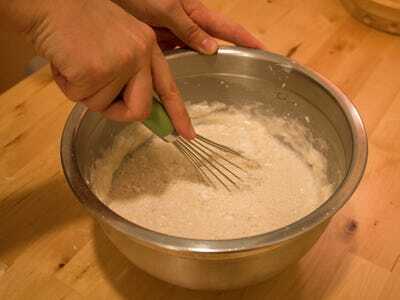 Next combine two parts flour and three parts water to make your papier maché. 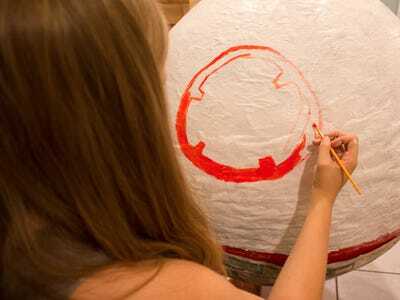 For more info on papier maché check out this site. 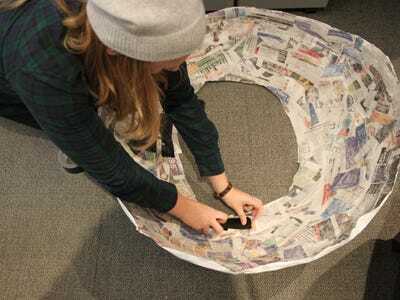 Dip strips of newspaper into your papier maché. 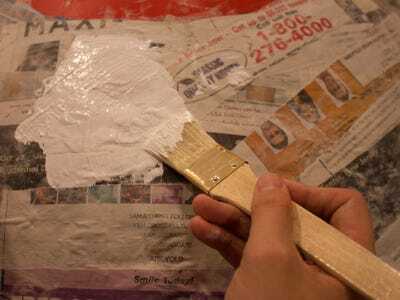 Make sure to wipe off any excess so the strip isn't too drippy. Apply the strip to the balloon. Repeat about a zillion more times. Here's the halfway point. 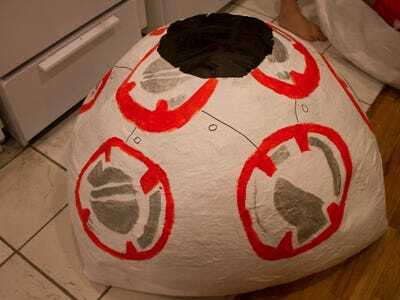 I made my BB-8 in two pieces so if would fit out my narrow apartment door. If you don't have space constraints, you can skip this step. I used an upside down mixing bowl as the form for my BB-8 hat. Here's the bowl covered in papier maché. 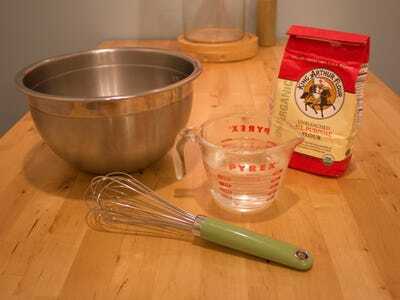 Don't worry about ruining your dishes, the papier maché wipes off easily with hot water. 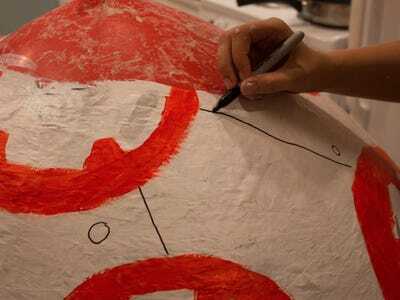 Applying the papier maché to the bottom half was a bit trickier. My roommates helped me string the balloon from out ceiling using dental floss, which worked surprisingly well. 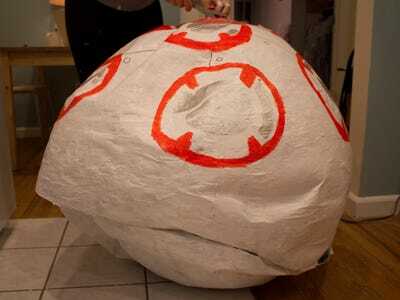 Here's the finished product with one layer of papier maché. I let it dry overnight and then repeated the whole process again the next day. 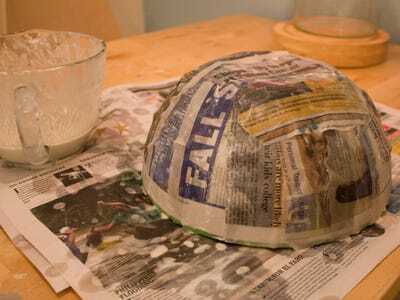 One the papier maché is dry, it's time to paint. 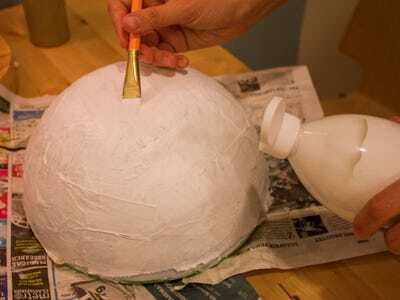 I covered the balloon in a coat of white. I used a black sharpie to add smaller details and lines. Don't think I forgot about my hat. Then it was time to pop the balloon. 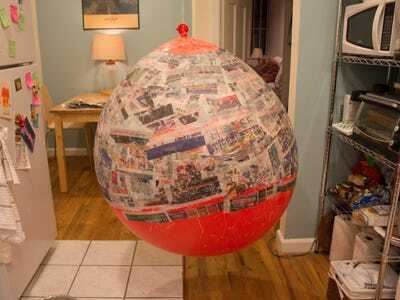 This was a little nerve wracking, as the papier maché crumpled a bit as the balloon deflated. 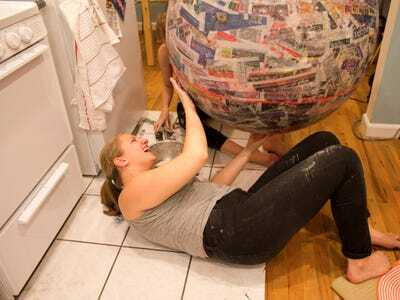 Luckily, the papier maché was pretty strong. 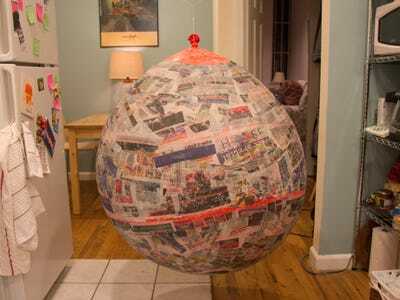 If I did this again, I'd definitely do a third layer of newspaper just for added strength. 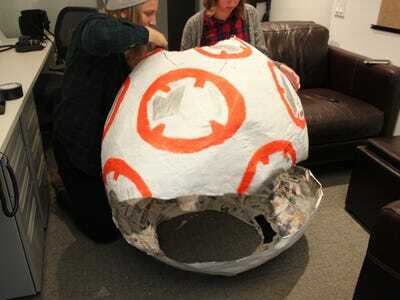 Here's the top piece of the BB-8. And here's the bottom. I used duct tape to patch up a few weak spots. 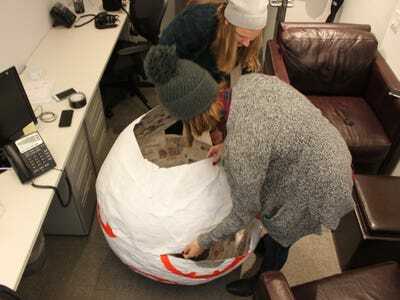 After thoroughly confusing an Uber driver with my giant papier maché creation, I got my BB-8 to the office and enlisted a few friends to help me with assembly. On Wednesdays we wear plaid. We used some more duct tape to combine the two pieces. Here's what the two pieces look like together. Now that it wasn't hanging upside-down, I added the last orange and silver details. I ran into a little bit of trouble getting out of the office door. But eventually, I managed to squeeze my BB-8 self through. 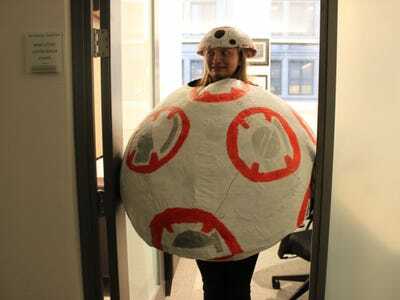 If this doesn't win the office Halloween costume contest, I don't know what will.